Houndour in game: 5,867 Who? Important notice! Pokemon Houndour is a fictional character of humans. Houndour (Japanese: デルビル Delvil) is a dual-type Dark/Fire Pokémon introduced in Generation II. It evolves into Houndoom starting at level 24. Houndour is a quadruped, canine Pokémon with short, black fur and a red underbelly and muzzle. Its ears and tail are both short and pointed. Two fangs protrude from its upper jaw, and its triangular nose is black. There are white bands on its ankles, and rib-like ridges on its back. 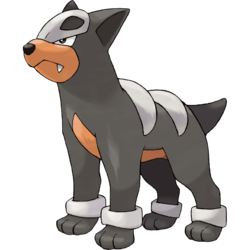 Houndour appears to have a simplistic, stylized skull on its forehead with the eye orbits composing eyebrow patterning above its actual eyes. It also has circular, red paw pads on each of its three-toed paws. Houndour is an intelligent Pokémon that forms packs to hunt for prey, and shows unparalleled teamwork. As seen in the anime, it will not abandon a sick pack member. It communicates using various barks and howls. Barks are used to determine the location of a pack member during a hunt, while howls are used as declaration of ownership over a territory. Houndour can typically be found around rough terrain. Houndour made its anime debut in Hour of the Houndour. A pack of these Pokémon were stealing food to aid their sick friend. Ash helped the ailing Houndour to a Pokémon Center. A Houndour is one of the enemies of the Pichu Brothers, and can normally be seen chasing them, or anyone else that angers it. It has appeared in Pikachu and Pichu, Trouble in Big Town, Of Meowth and Pokémon, Pichu Bros. in Party Panic and made a cameo in Giratina and the Sky Warrior. Cassidy's Houndour debuted in The Mystery is History. Multiple Houndour have appeared in From A to Z!, Meeting at Terminus Cave!, and A Towering Takeover! under the ownership of Team Flare Grunts. A Houndour belonging to a Trainer named Ralph appeared at the Pokémon Jujitsu Academy in Ariados, Amigos where it defeated Mickey's Hypno. Two Houndour were among the Pokémon resting in some hot springs in Entei at Your Own Risk. A Houndour was seen being fed by Tracey at Professor Oak's Laboratory in Johto Photo Finish. A Houndour made a small appearance in The Rise of Darkrai as one of the Pokémon Darkrai hit with a Dark Void. A group of Houndour also appeared in Genesect and the Legend Awakened at Pokémon Hills. A Houndour appeared during Mega Audino journal in A Race for Home!, where it was fighting with a Scraggy. EP150 Houndour Ash's Pokédex Houndour, the Dark Pokémon. Houndour travel in packs and communicate though barks in order to surround their prey. In Pokémon Adventures, Gold is attacked by and defeated by four Pokémon, including a Houndour, when he enters the Ilex Forest, and is then warned to stay out by the Masked Man in You Ain't Nothin' but a Houndour and The Ariados up There. This Houndour is later used against Lt. Surge during his battle against the Masked Man, where its howls summon a herd of wild Houndour to aid it in battle. Although their constant howling prevented Lt. Surge from moving, he is able to have multiple Electrode use Selfdestruct to knock them down, allowing Surge to flee during the confusion. One of Carl's Houndoom was seen as a Houndour at the start of the FireRed & LeafGreen chapter, the round in which Green and Silver escaped from Pryce. Shū has a Houndour in the Pokémon Gotta Catch 'Em All manga. Houndour is Grey's only known Pokémon in the The Golden Boys manga. Giovanni used a Houndour as part of his evil plans in PM081. It uses different kinds of cries for communicating with others of its kind and for pursuing its prey. To corner prey, they check each other's location using barks that only they can understand. Around dawn, its ominous howl echoes through the area to announce that this is its territory. Houndour communicate with each other using a variety of cries to corner their prey. This Pokémon's remarkable teamwork is simply unparalleled. It conveys its feelings using different cries. It works in a pack to cleverly take down prey. It is smart enough to hunt in packs. It uses a variety of cries for communicating with others. Moves marked with a superscript game abbreviation can only be bred onto Houndour in that game. 51%-100% HP I'm good at running down prey using teamwork. 26%-50% HP My HP's been cut in half. Level up Yes! I got my level up! I'll work harder! It spits blobs of fire and lets loose dark pulses to attack. It releases a dark pulse around itself that makes Pokémon Tired. For other sprites and images, please see Houndour images on the Bulbagarden Archives. Despite being a Generation II Pokémon, it was actually native to Kanto in Pokémon Gold, Silver, and Crystal. The same is true for Murkrow and Slugma. The only three games so far in which Houndour can be captured by the player before viewing the end credits are Pokémon XD, Pokémon Platinum, and Pokémon X.
Houndour is one of fourteen Pokémon that one can collect foreign Pokédex entries for in Pokémon Diamond and Pearl. Houndour may have been based on the Cerberus of Greek and Roman mythology, or other legends of hellhounds. 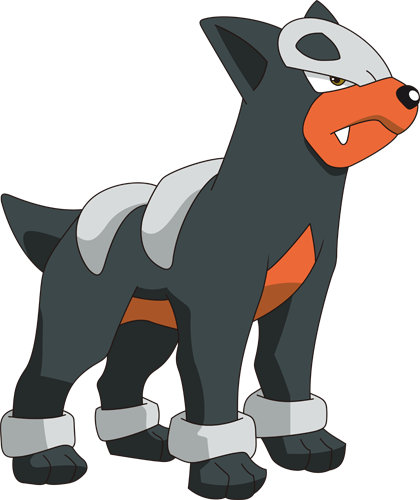 Houndour is also similar in appearance to Dobermanns and Rottweilers. 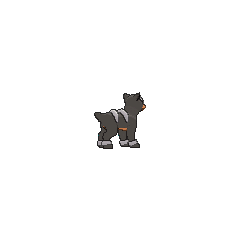 Houndour is a combination of hound and dour (sullen or severe). Delvil is a corruption of devil.